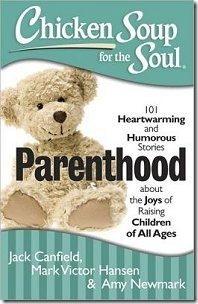 Another great Chicken Soup for the Soul book for parents. 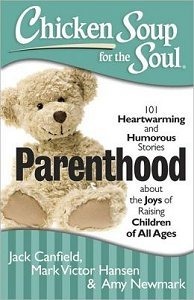 I love that this one is written by moms and dads of all kinds and not just for one or the other. I especially enjoyed the stories by men as it’s less often that you hear about the joys of parenting from men. It was only a few stories in that I read the FUNNIEST story. So funny I was cracking up laughing in the bathroom (because that happens to be where I was reading it.) Anyone in the house must have though I’d gone crazy I was laughing so hard. I’m pretty sure I had trouble breathing. STOP – Before you read on, swallow your drink, put down the breakables and prepare for extreme laughter! Not all the stories are humourous although there are plenty of them. Some are touching, some are a bit sad and some will bring you good memories of when your child(ren) did something similar. You have got to love the cartoons that are included in most Chicken Soup for the Soul books, they are always SO funny! When you are having a tough day as a parent, pull out this book and take a few moments to read the stories. Reading these stories will remind you of the good times you’ve had as a family and allow you to appreciate your family.